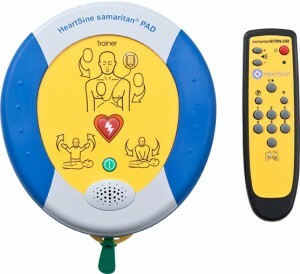 The easy-to-use samaritan® PAD Trainer with remote control guides users through simulated analysis, energy delivery and prompted Cardio Pulmonary Resuscitation (CPR) intervals with the look and feel of a live samaritan Public Access Defibrillator (PAD) without the actual charge and discharge of an electrical shock. The design of the samaritan® PAD Trainer mirrors the live device in order to ensure greater user retention and system familiarity. As such, the PAD Trainer is easy to use, allowing the trainer the maximum time possible to focus on the learning needs of the group. The Trainer, which is compatible with any CPR manikin system, provides six pre-recorded rescue training scenarios without delivering an actual shock. The samaritan PAD Trainer is available in the SAM 300P, SAM 350P, SAM 360P and SAM 500P models. Note: HeartSine strongly advises that potential users of defibrillators ensure their training is in line with current ERC/AHA Guidelines and are aware of the regulations and guidelines relating to training and the use of an AED in their specific country. Simulates Full Range of “Real Life” Scenarios. The multi-function remote control enables instructors to select among six AHA/ERC scenarios for live demonstrations or training. One remote control can even operate multiple trainer units at a time (within a range of 10-15 feet/3-5 meters). The Trainer also is compatible with any CPR manikin system. Realistic Training Demonstration and Superior Retention. Voice and visual prompts and CPR coaching match those of the HeartSine samaritan PAD defibrillator. Likewise, size and shape are the same; however, unique labeling and membrane color prevent inadvertent use in an actual emergency. Cost-Effective. The Trainer is powered by a rechargeable battery. Electrode pads are cost-effective and reusable, and mimic the Pad-Pak™ battery/pad cartridge unique to the HeartSine samaritan PAD defibrillator. Cable rewind mechanism. This new mechanism provides easy replacement of pads and cables after each session, thus reducing time spent resetting the system. Rechargeable Battery. The Trainer’s rechargeable battery operates up to seven hours—a full day of training—on a single charge. The battery recharges in just four hours. Pause Button. Temporarily stops, then resumes, the training scenario to enable the trainer to offer additional explanation and support to the class. Volume Configurable. Five selectable volume levels with default to last selection. Selectable Training Scenarios. Six pre-programmed AHA/ERC scenarios. Training Pads. Five pairs of reusable, replaceable training electrode pads included. Compatible with all training manikins, the new electrode pads are now easier to place back on the pad liner. Upgradable. Updates to Trainer software availabie on the HeartSine website. Language Options. Twenty-nine language options enable the Trainer to provide instructions in the local language. Selectable Training Scenarios: 1. SHOCK ADVISED (SA) condition, followed by CPR.2. NO SHOCK ADVISED (NSA) condition, followed by CPR.3. CHECK PADS, followed by an SA condition and CPR.4. Starts directly in “ANALYZING” mode, followed by SA & CPR, SA & CPR, and NSA & CPR.5. SHOCK ADVISED (SA) condition, followed by CPR, 30 compressions and 2 breaths6. NO SHOCK ADVISED (NSA) condition, followed by CPR, 30 compressions and 2 breaths.